Performance validated using a wide range of cell densities. Does not require RNase treatment. UV laser source is not required for excitation. Enzo Life Sciences’ GFP-CERTIFIED® NUCLEAR-ID® Red Cell Cycle Analysis Kit provides a convenient approach for studying the induction and inhibition of cell cycle progression by flow cytometry. 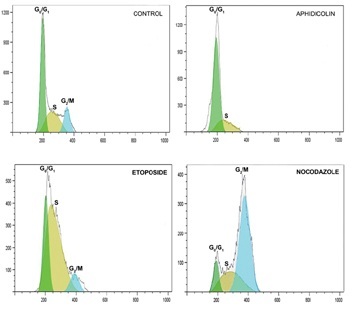 The kit is suitable for (1) determining the percentage of cells in a given sample that are in G0/G1, S and G2/M phases, as well as to quantify cells in the sub-G1 phase, and (2) DNA studies in live, permeabilized and fixed cells for normal cell lines and cell lines exhibiting multiple ploidy levels. A control cell cycle perturbation agent, Nocodazole, is provided for monitoring changes in cell cycle dynamics. Potential applications for live-cell studies are in the determination of cellular DNA content and cell cycle distribution for the detection of variations in growth patterns, for monitoring apoptosis, and for evaluating tumor cell behavior and suppressor gene mechanisms. Figure 1: Three-dimensional reconstruction of the spatial relationship between the green fluorescent protein-expressing (GFP-expressing) mitochondria and the nucleus using a structured illumination method, as implemented with the ApoTome from Carl Zeiss, Inc. This imaging method enabled creation of optical sections through the nucleus using a conventional fluorescence microscope, for improved resolution along the optical axis. 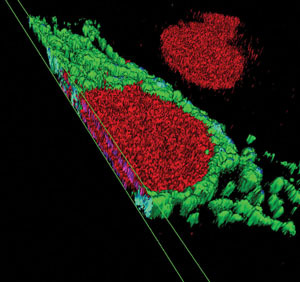 The optical sections were then used to create a 3-D reconstruction of the nucleus, enabling the GFP-expressing mitochondria to be displayed in their proper spatial context. NUCLEAR-ID® Red DNA Stain requires lower concentration than competitor’s dye to visualize dsDNA. HeLa cells were grown to ~60% confluency. Cells were stained with NUCLEAR-ID® Red DNA Stain or a competitor’s dye at a final concentration of 2.5 or 5µM for 15 min at 37°C and gently washed post-staining. Cells were imaged at 15 min and 24h. Results show that 2.5µM NUCLEAR-ID® Red DNA Stain was required for visualization of the dsDNA, while 5.0µM was required for the competitor’s dye. At 24h, the competitor’s dye intensity and cell growth were dramatically reduced at the 5µM final concentration. At the same time point, 5µM of NUCLEAR-ID® Red DNA Stain did not affect cell growth or fluorescent intensity. The NUCLEAR-ID® Red DNA Stain shows lower cytotoxicity and requires lower concentration in live cell studies, resulting in lower costs. Relative costs of using Nuclear ID® Red DNA in comparison to competitor dye in various applications: (A) Imaging (visualization), (B) Nucleated Cell Gating (flow cytometry) and (C) Live Cell Cycle analysis using flow cytometry. Dilutions can vary depending on cell strain and cell concentration. Figure 2: Drug treatments with live cells inhibit cell cycle progression at different phases. Application Notes: Suitable for DNA studies in live, permeabilized and fixed cells for normal cell lines and cell lines exhibiting multiple ploidy levels. A sample from each lot of GFP-CERTIFIED® NUCLEAR-ID® Red Cell Cycle Analysis Kit is used to analyze Jurkat cells using the procedures described in the user manual. Cells with Nocodazole gave %G2 value of >60%. Untreated cells gave the following results: (a) G0/G1 peak CV < 15%; (b) %G1 > 35%; (c) %G2 < 15%; and (d) G2/G1 ratio > 1.8. Technical Info/Product Notes: The GFP-CERTIFIED® NUCLEAR-ID® Red Cell Cycle Analysis Kit is a member of the CELLESTIAL® product line, reagents and assay kits comprising fluorescent molecular probes that have been extensively benchmarked for live cell analysis applications. CELLESTIAL® reagents and kits are optimal for use in demanding imaging applications, such as confocal microscopy, flow cytometry and HCS, where consistency and reproducibility are required. For an application note please click here. Treat cells with or without experimental compounds. Resuspend cells in appropriate buffer at a concentration of ≤ 5 x 105/ml in a test tube. Prepare NUCLEAR-ID® Red DNA Stain solution with media or common cell culture buffer of choice. A 250-fold to 500-fold dilution of NUCLEAR-ID® Red DNA Stain is recommended for live cell cycle DNA analysis (final concentration of 40µM to 20µM, respectively). A 500-2000-fold dilution of NUCLEAR-ID® Red DNA Stain is recommended for ethanol-fixed or permeabilized cells. Prior to staining, collect the cells by centrifuging at 400 x g for 5 minutes. Carefully remove the supernatant. Re-suspend the cells in 0.5ml freshly diluted staining solution. Gently mix and then incubate for 15-30 minutes at either room temperature or 37°C. Cells can be analyzed with flow cytometry directly without further treatment or washing. Analyze the samples in the PerCPCy5.5 or FL3 channel of a flow cytometer with a 488nm excitation laser. For 633nm excitation, use appropriate collection filters >700nm, FL4 or FL5, APC-Cy7 channel. Adherent Cells. Grow adherent cells on cover slips inside a Petri dish filled with the appropriate culture medium. When the cells have reached the desired level of confluence, carefully remove the medium and dispense sufficient volume (~100 µl) of a 2000-fold to 4000-fold dilution (in media or buffer of choice) of NUCLEAR-ID® Red DNA Stain (final concentration of 5.0 µM to 2.5 µM respectively) to cover the monolayer of cells. Cell Suspensions. Centrifuge the cells for 5 minutes at 400 x g at room temperature (RT) to obtain a cell pellet. Then, carefully remove the supernatant by aspiration and dispense sufficient volume of a 2000-4000-fold dilution (in media or buffer of choice) of NUCLEAR-ID® Red DNA Stain (final concentration of 5.0µM-2.5 µM, respectively) to cover the dispersed cell pellet. Protect samples from light and incubate for 15-30 minutes at 37°C. Wash the cells with 100µl buffer of choice, such as PBS. Remove excess buffer and place coverslip on slide. Analyze the stained cells by wide-field fluorescence or confocal microscopy (60X magnification recommended). Use a standard Rhodamine or Texas Red filter set for imaging the nucleus.